Samsung Electronics Co., the world's third-largest mobile phone maker, was charged Monday with allegedly advertising false and exaggerated information about its high-end multimedia mobile phones. Consumers groups have launched a legal challenge against Samsung over what they say are the company's exaggerated claims for its mobile phones. In the complaint filed with the Suwon District Prosecutors' Office, Chung Joo-young, 20 who is leading the consumer groups, called "V4400 Consumers' Power" and "Tipsters for the Public Good,"accused Samsung of cheating customers by airing false and exaggerated information about the phone, which is priced at about 750,000 won (US$740) before subsidies. The complaint was signed by 467 disappointed users. Attached were the signatures of 2,899 people. 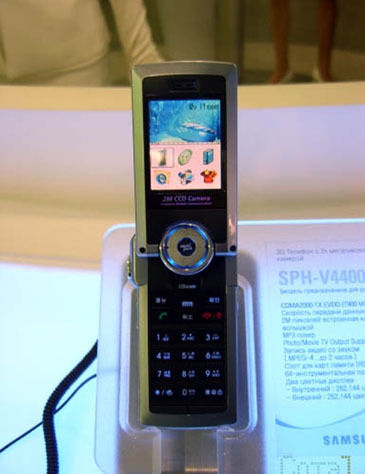 The SPH-V4400 hit markets in June last year. It is equipped with a 2 megapixel camera besides the offending camcorder and MP3 player. Boosted by commercials featuring popular actor Kwon Sang-woo, the phone sold more than 170,000 units in four months, despite its hefty price tag of W700,000 (about US$700). Samsung described the phone's video-recording quality as being equivalent to a digital camcorder in television and newspaper ads, but the reality is closer to closed-circuit television cameras, Chung said in an interview with Internet news provider Pressian. In contrast to how the company is marketing the V4400, its built-in digital music player lacks basic functions such as rewind and fast-forward, which are standard features in models provided by rival companies, Chung said. Aside from the false advertising, he also pointed out a series of hardware problems with the expensive handset. "Samsung sold these mobile phones without carrying out proper tests before retail sales due to competition," Chung was quoted as saying. "This criminal action will be bad for the Samsung brand and image,"' he added. He also filed similar complaints to the Fair Trade Commission, an anti-trust regulator, and the Korea Consumer Protection Board, a state customer rights organization. Samsung sent a letter to Chung in February 2005 threatening him with civil and criminal action if he continued the campaign. Officials at Samsung Electronics' public relations office could not be reached by the Seoul Times for any comment.